Our 2018 COUNTRYSIDE CORN MAZE celebrates the City of Vero Beach Centennial with family fun! Open 10AM to 5PM on Saturdays and Sundays from September 29th through November 4th, you'll enjoy every minute of our games, rides and crazy photo ops. Get lost in our Maze! Bounce high on our Jumping Pillow. Challenge your friend on the Rat Roller. 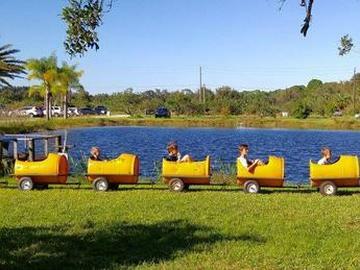 Ride the Kiddie Train. Race your rubber duck. Try your hand at the Barnyard Ball Zone. Braid the Horse Tail! These games and more included in the $12 admission fee. (Ages 3 and under are FREE) Hay Ride and Corn Cannon available for a small fee. The fun will unfold in hundreds of photo ops! Salute Colonel Corn and dance with the Silly Scarecrow! Come hungry and feast on festival favorites like Crispy French Fries - served plain or loaded, Butter Bun Burgers, Pulled Pork, Corn Fritters with Honeycrisp Dunk, Candied Bacon, Kettle Corn, Soft-Serve Ice Cream, Snowballs and Homemade Lemonade. FLASH LIGHT MAZES scheduled for October 19th and 20th! Bring your flashlight and enjoy this great adventure in the dark from 6:30 to 10:00PM. Interested in having your school group, church, scout troop or other organization of ten or more get LOST in the MAZE? Field trips available on Tuesdays and Wednesdays. Choose morning or afternoon. Call us at 772-581-0999 to make your special arrangements and save your date.